Rich in medieval history, bustling and lively Trondheim occupies a triangular peninsula bordered on one side by the river Nidelva and by the Trondheimsfjorden fjord on the other. 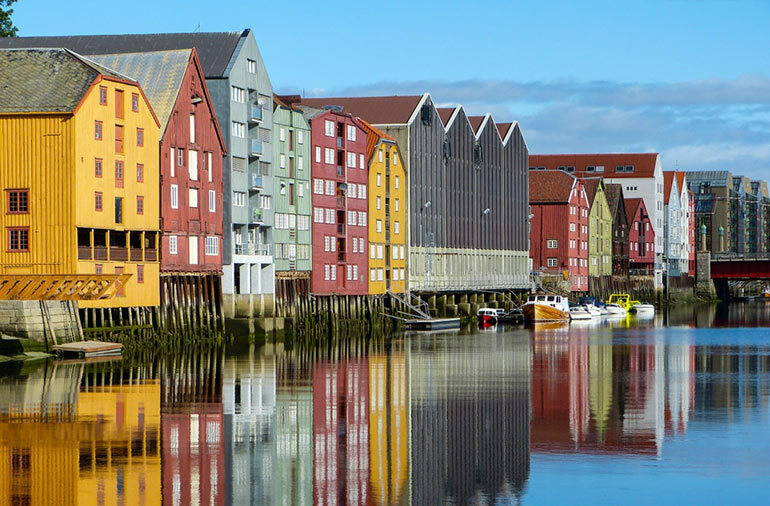 Trondheim is an easy place to explore by foot and features some impressive medieval buildings steeped in the history of Norway, whose first capital was located at this busy university city. The most dominant landmark of Trondheim is the superb Nidaros Cathedral, located on the site of the grave of Viking Saint Olav. This inspiring cathedral is the largest medieval building in Norway with its most noteworthy attributes being the dazzling modern stained glass work and the elaborately decorated exterior west wall, featuring statues of biblical figures and Norwegian dignitaries. Enjoy a stroll down the cobblestoned streets in the city’s older sections and make your way through these winding thoroughfares to sample the hustle and bustle of the Torvet, Trondheim’s central square which is alive with the activities and calls of street vendors selling a range of fruit and vegetables. Gain a fine panoramic view of Trondheim by taking the heart-stopping journey to the top of the Tyholt Tarnet, a 74-metre-high telecommunications tower with an observation tower and a revolving restaurant at its top. Take a trip to the Stfitsgarden, the official royal residence in Trondheim and get lost in its long series of period rooms, or simply enjoy a leisurely stroll at the Ringve Botanical Gardens, with its charming quiet green areas perfect for rest and relaxation. Prepare a picnic and take the short ferry journey to Munkholmen, the island site of a former monk’s monastery that has become a popular picnic and sunbathing venue for locals and tourists alike. Head to the west of Trondheim to Bymarka, a fresh and green woodland area sprinkled with nature walks and ski trails. In the evening, savour the atmosphere and energy of Trondheim’s nightlife and enjoy a refreshing beer in one of its many bars and cafes and follow this up with a meal in a wide variety of restaurants offering a selection of local and international cuisine. Delight in the sights and sounds of this cheerful and compact city, sample its history, culture and cuisine, and soak in its sunshine at the waters edge. Take time to explore a city offering a wide range of activities and attractions catering for every taste. Trondheim, a city offering the best of all worlds.